American Psychiatric Publishing, 9781585624942, 358pp. Building on the best-selling Pocket Guide to the DSM-5(TM) Diagnostic Exam, The DSM-5(R) Pocket Guide for Child and Adolescent Mental Health teaches readers how to formulate a diagnosis and treatment plan for this patient population. Because these patients are more likely to initiate mental health treatment in a primary care rather than specialty care setting, the authors pay particular attention to the practical exigencies of the primary care setting. Accordingly, chapters are devoted to topics such as diagnostically interviewing around different chief complaints; performing 15- and 30-minute versions of the diagnostic interview; recognizing developmental milestones and red flags for referral, and more. The book's structure is flexible, affording readers the freedom to read sections in their entirety for background or to use the guide on the fly, as with interview questions for specific diagnoses. The book is an essential reference for primary care physicians, pediatricians, residents in training, and general psychiatrists, and other practitioners caring for children and adolescents experiencing mental distress and mental illness. The authors have designed the book with a variety of useful features: - Multiple tables and figures make expert advice readily accessible, including tables for developmental milestones, common clinical concerns, and medications.- Brief supplements to the diagnostic interview are presented, including an easy-to-use summary of DSM-5 disorders, a stepwise approach to differential diagnosis, the mental status examination and a psychiatric glossary, DSM-5-related diagnostic tools and scales, and coverage of alternative diagnostic systems and rating scales.- A seven-step sequential framework for generating a differential diagnosis helps clinicians develop their clinical decision-making skills and ensure that they take into account the many and interrelated causes of mental disorders.- Initial psychosocial recommendations are included for such topics as sleep hygiene and behavior management. Recognizing that clinicians need to use DSM-5 criteria and evidence-based treatment protocols to formulate treatment plans, the authors designed this book for all levels of experience. 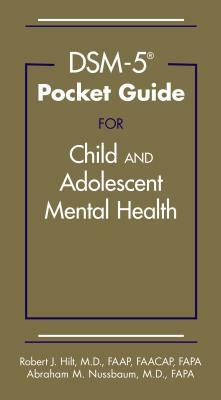 Direct, practical, and informative, The DSM-5(R) Pocket Guide for Child and Adolescent Mental Health will enable readers to efficiently and effectively use DSM-5 as part of a comprehensive diagnostic interview and treatment planning. Robert J. Hilt, M.D., FAAP, AACAP, is Associate Professor, Department of Psychiatry, at the University of Washington and Director, Partnership Access Line at Seattle Children's Hospital.Abraham M. Nussbaum, M.D., AACAP, is Director of the Denver Health Adult Inpatient Psychiatry Service and Assistant Professor in the Department of Psychiatry at the University of Colorado School of Medicine.